This article is not sponsored in any way I swear, but I might not be totally objective or neutral regarding this chic new lunch spot in Eaux-Vives. Indeed, it is one of my best friend from high school, Charlotte, a young dynamic mom of two adorable toddlers, who decided to become an entrepreneur and launch her own place and brand. 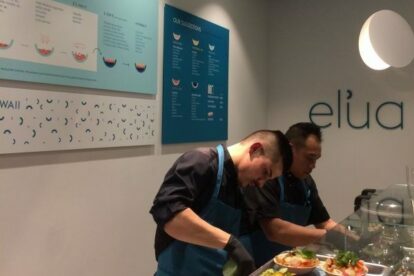 It is called Elua and it is the only poke bowl restaurant in French-speaking Switzerland. Elua means “two” in Hawaïan, and it makes sense since it is the adventure of two girlfriends: Charlotte and Chiara. I am a little jealous and very impressed by these two women who started their own business. We should definitely salute girl power! You can either pick one of their delicious selections or if you feel creative, make your own bowl. Personally, my favorite is the Kailua bowl. You better come early, when they open at 11:30, they have very limited seating and this place is already very popular among the pretty young ladies of Geneva.